The Screaming Penny: Dominos Pizza: 50% off Pizza Code! 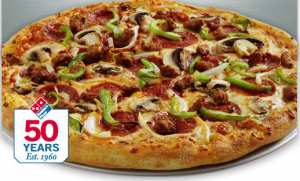 Dominos Pizza: 50% off Pizza Code! Dominos has a great coupon code on their Facebook page! They just turned 50 and are giving you a coupon code for 50% off! Use coupon code: 50OFFPIZZA from now until 12/19 to get 50% off! Thanks, MojoSavings.